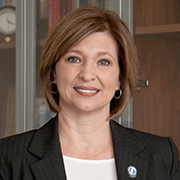 LouAnn Woodward, M.D., became vice chancellor for health affairs at the University of Mississippi Medical Center and dean of the University of Mississippi School of Medicine March 1, 2015. In this role, she is responsible for the overall strategic direction of the Medical Center, a $1.6 billion enterprise. Previously, she served for five years as associate vice chancellor for health affairs and vice dean of the School of Medicine during the tenure as vice chancellor of Dr. James E. Keeton. A native of Carroll County, Woodward attended medical school and completed a residency in emergency medicine at University of Mississippi Medical Center after graduating from Mississippi State University. She joined the faculty in the Department of Emergency Medicine, where she holds the rank of tenured professor. Woodward has published a number of research articles and is a frequent presenter at academic and professional meetings. She is an active member of the Association of American Medical Colleges, the Mississippi State Medical Association, the Society of Academic Emergency Medicine and the American College of Emergency Physicians, among other groups. She is a fellow of the American College of Emergency Physicians. During her tenure as associate vice chancellor, she served as the executive sponsor of the enterprise-wide Lawson business system implementation. In 2013, she was appointed as a member of the Liaison Committee for Medical Education, the accrediting body for all medical schools in the United States and Canada, and chairs the subcommittee on International Relations. She was a leader for the development of the UMMC 2020 strategic plan and has successfully recruited several individuals into key leadership roles for the Medical Center. In 2008, she was selected as an Outstanding Business Woman for Mississippi by the Mississippi Business Journal and was a finalist for Business Woman of the Year. She and her husband, Jon, live in Madison and are the parents of four children.